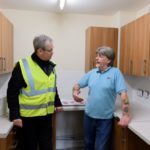 Chief Executive Glenn Harris recently met some of the tenants who are getting new kitchens and bathrooms, as well as staff from one of the contractors carrying out the work as part of a multi-million pound refurbishment programme. Glenn said: “It was an excellent and informative visit; it’s always good to experience the positive partnership working that exists between Midland Heart teams and our contractors in delivering a high quality product to our customers. Alison Archer, Contracts Manager at Midland Heart, said: “This is a rolling programme of improvement and a significant investment. We replaced 757 kitchens and 454 bathrooms in our properties between January and December 2018 and for the same period this year the figures will increase to 933 kitchens and 701 bathrooms.